Our Masterpiece. Romantically and practical. Box-shaped. Availiable in many sizes. Starting from single bed till 78.8 x 78.8 inch (200x200cm). Height of all models is approx 98.5 inch (250cm). Suitable for beds up to 87×87inch (220×220cm). BigSky hangs on four points and has four courtains, which overlap in the middle by about 23inch (60cm). The delivery contains four chords for the curtains. 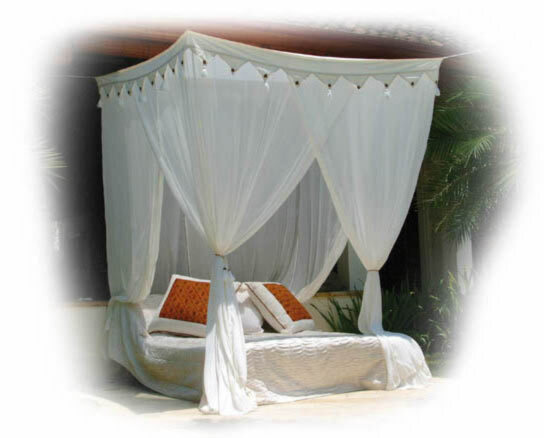 We ourselves also always have a canopy over the bed all year round. Once you’ve slept under one for a while, a bed without a canopy seems really bare.